Any agroforestry-related event missing? 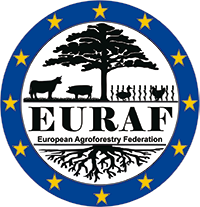 Please forward information to euraf [at] agroforestry [dot] eu (EURAF). The conference will take place in Berlín, Germany, during 10th – 13th September 2018. The conference will focus on agricultural GHG emission reduction in the light of climate change, sustainable agriculture and food security. One of the topics of the conference is soil carbon sequestration and agroforestry. The deadline for paper and poster contributions is 30th April 2018. More info here. Mosquera-Losada MR (2015) The European Agroforestry Federation (EURAF) and Agroforestry in Europe. Presentation at the Agroforestry Event at EXPO 2015, Milan, Italy. 12 September 2015. Rosati A (2015) What's Agroforestry anyway?. Presentation at the Agroforestry Event at EXPO 2015, Milan, Italy. 12 September 2015. Balager F (2015) Agr’eau: developing a resource-efficient, ecofriendly, climate-smart agriculture across the Adour-Garonne watershed (South-West France). Presentation at the Agroforestry Event at EXPO 2015, Milan, Italy. 12 September 2015. Borelli F (2015) Agroforestry and Food Security Challenges and perspectives. Presentation at the Agroforestry Event at EXPO 2015, Milan, Italy. 12 September 2015. Szedlak T (2015) Agroforestry in the EU Common Agricultural Policy and in the new EU Forest Strategy. Presentation at the Agroforestry Event at EXPO 2015, Milan, Italy. 12 September 2015. Burgess P (2015) The AGFORWARD Project. Presentation at the Agroforestry Event at EXPO 2015, Milan, Italy. 12 September 2015. Brunori A (2015) PEFC SFM certification: and Agroforestry?. Presentation at the Agroforestry Event at EXPO 2015, Milan, Italy. 12 September 2015. Bas-Defossez F (2015) How can we reap the full economic and environmental potential of agroforestry, and make it go mainstream?. Presentation at the Agroforestry Event at EXPO 2015, Milan, Italy. 12 September 2015. Ferraio V (2015) Morte e rinascita della piantata padana (Death and rebirth of the "piantata" in the Po area). Presentation at the Agroforestry Event at EXPO 2015, Milan, Italy. 12 September 2015. Mele M (2015) La modernità dei sistemi integrati agro-silvo-pastorali in Italia (Modernity of integrated agrosilvo-pastoral systems in Italy). Presentation at the Agroforestry Event at EXPO 2015, Milan, Italy. 12 September 2015. Pisanelli A, Rosati A (2015) Agroforestry e PAC in Italia (Agroforestry and CAP in Italy). Presentation at the Agroforestry Event at EXPO 2015, Milan, Italy. 12 September 2015. Mezzalira G (2015) Fare arboricoltura da legno in una moderna azienda della pianura veneta: l’Azienda Casaria di MasiPD (Growing hardwoods in a modern farm in the Veneto Region: the Casaria di Masi farm). Presentation at the Agroforestry Event at EXPO 2015, Milan, Italy. 12 September 2015. Da Schio F (2015) Agroforestazione ed agricoltura conservativa: il caso dell’azienda di Francesco da Schio (Agroforestry and conservation agriculture: the case of Francesco da Schio's farm). Presentation at the Agroforestry Event at EXPO 2015, Milan, Italy. 12 September 2015. Gumiero B (2015) Funzione depuratrice dei sistemi arborei di pianura (Depuration function of tree systems in the plains). Presentation at the Agroforestry Event at EXPO 2015, Milan, Italy. 12 September 2015. Theme: Woodfuel from Agroforestry. Further details here. Motto: "Towards sustainable intensification". Link to programme and further information. Motto: "When Research and Field Work collaborate"
Early/mid November 2015. More information about the event the websites: www.utvecklingnordost.se, www.skogsjordbrukvast.se. Theme: Visite "Opération haie-cocitoyenne L'arbre, source de vie de sols agricoles"? Further details. Theme: Les systèmes agroforestiers permettent-ils de fonder un développement agricole durable? Further details. Theme: Trees facing drought problems. Inscription open until March 13. Further details. Theme: Trees in Agriculture. Inscription is free, but required.Further details. A symposium dedicated to reinvigorate non-wood forest products from the Montado system for human consumption. Link to the programme. freixodomeio [at] gmail [dot] com (Email address) for Inscriptions/inquiries. December 17, 2014. DG Agriculture and Rural Development. EURAF will represent agroforestry interests in the Forestry and Cork Civil Dialogue Group. December 12, 2014. DG Agriculture and Rural Development. EURAF will represent agroforestry interests in the Arable crops Civil Dialogue Group. Scientific meeting, organized by the project “AgroForstEnergie – Economic and Ecological Evaluation of Agroforestry Systems in Farming Practice. Link to the conference website (German). The meeting was scheduled at the end of the 4th Agroforestry Forum (see previous point). Further information: The day is organized within the framework of the following agro-ecological agroforestry project: “L'agroforesterie au service du projet agro-écologique sur les territoires”. Link to the programme and to further information (French). Where & when: Paris, 1 December 2014. Further information: Link to the invitation (French). Further information: Organized within the framework of the following agro-ecological agroforestry project: “L'agroforesterie au service du projet agro-écologique sur les territoires”. Link to the programme (French).